Known as the ‘Eternal City’, Rome is an Italian destination filled with history, culture and more than its fair share of world renowned attractions. Holding a history that spans several millennia, there’s nowhere quite so intriguing as this ancient Italian capital. If you’re planning a visit, be sure to check out our handy guide and discover where to stay in Rome, Italy. Home to picturesque cobblestone streets and some of the city’s best known attractions, Centro Storico (Historic Centre) is a great choice whether it happens to be your first time visiting or you are simply wanting to base yourself conveniently close to some of Rome’s best sights. Busier than some of its counterparts, particularly during peak season, the neighbourhood is vibrant and atmospheric, boasting a wide variety of cafes, restaurants, bars and shops alongside its spectacular historic sites. Spend an afternoon soaking up the beauty of the Pantheon, enjoying a stroll through the Piazza Navona or wishing for your safe return to Rome with a traditional over-the-shoulder coin toss at the Trevi Fountain. Accommodation in Centro Storico can be more expensive than some other neighbourhoods, but the location does make exploring central Rome that little bit easier, with numerous landmarks found within walking distance. What’s in Centro Storico? 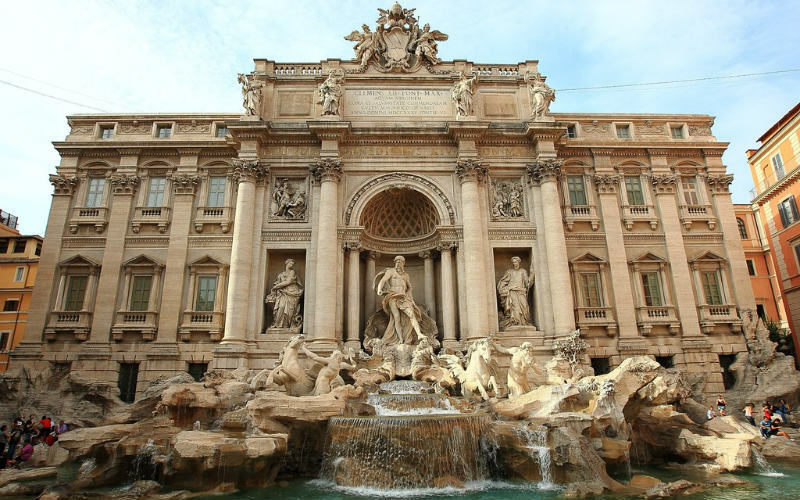 A number of Rome’s most famous attractions, including the Trevi Fountain, the Pantheon and Piazza Navona. Stay in Centro Storico if… you want to be close to some of the city’s most famous sights and don’t mind paying a little more for your accommodation. The Trevi Fountain, Rome, Italy. The home of Europe’s oldest Jewish community, Rome’s Jewish Quarter is another charming district found close to the city’s centre. 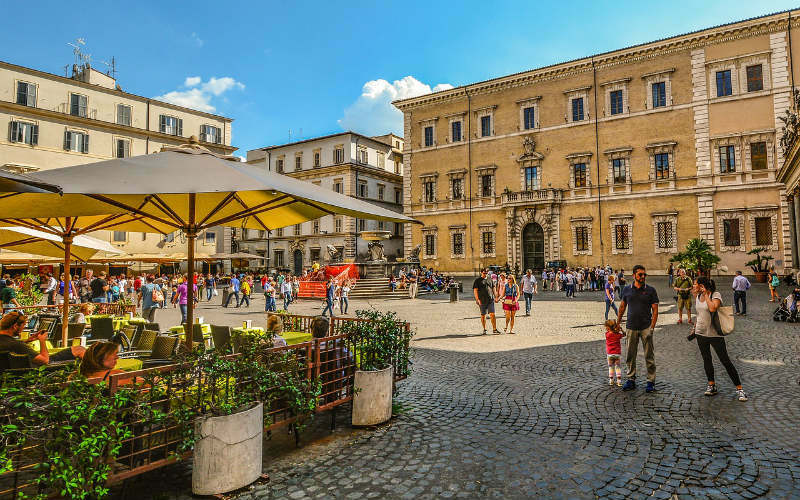 Filled with history, culture and plenty of great places to eat, it’s a part of the city that is lively, but generally quieter than some other neighbourhoods that are also within close proximity to central Rome. Boasting a number of wonderful sights, including the Campo de’ Fiori Market, Teatro di Marcello (the Jewish Colosseum) and La Bocca della Verità (the Mouth of Truth), the quarter is also an attraction in its own right thanks, in part, to its long, and at times tumultuous, history. Originally the site of a crowded Jewish ghetto established in the 16th century, the area flourished once its isolating perimeter walls were brought down in 1888. Unfortunately, World War II left a heavy mark on the community, with just 16 of its residents left to rebuild the community and culture the district was so well known for. What’s in the Jewish Quarter? Charming buildings, the Campo de’ Fiori Market, Teatro di Marcello (the Jewish Colosseum) and La Bocca della Verità (the Mouth of Truth). Stay in the Jewish Quarter if… you want a Roman experience complete with rich history and great food. Campo de’ Fiori Market, Rome, Italy. Image Credit: g e n e v i e v e / CC by 2.0. Historically the heart of Rome’s red light district, Monti has transformed over time to become one of the city’s hippest neighbourhoods. Where slums stood in ancient times, cafes, bars and arty boutiques can now be found, helping to shake off a negative reputation held for hundreds of years. Found just a short walk from the Colosseum and Piazza Venezia, the neighbourhood is often more popular with locals and expats than tourists, making it a great spot to enjoy a taste of authentic modern Roman life. 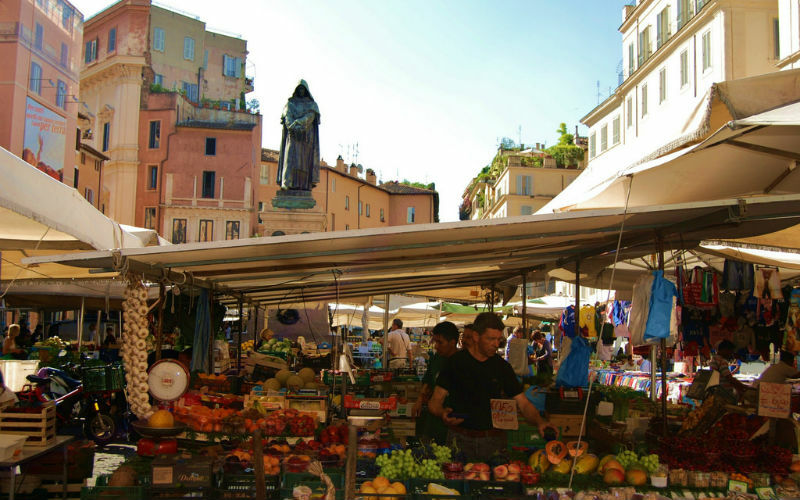 Set aside some time to check out the ornate interior of Santa Maria Maggiore (a papal basilica), browse the neighbourhood’s great boutiques and vintage stores, or to snap up a bargain at the quarter’s weekly markets, the Mercato Monti. What’s in Monti? 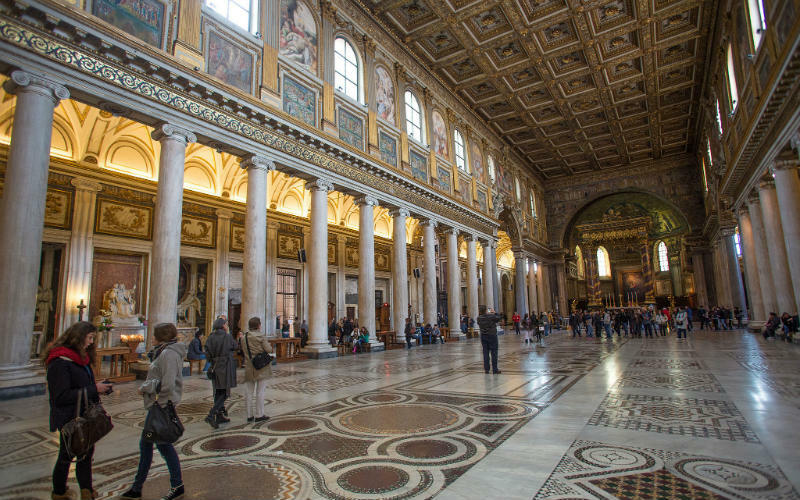 The historic Santa Maria Maggiore, an assortment of boutiques and plenty of great spots for a drink or bite to eat. Stay in Monti if… you’re searching for good food, great shopping and somewhere with a trendy vibe. Santa Maria Maggiore, Rome, Italy. Image Credit: Roman Catholic Archdiocese of Boston / CC by ND 2.0. Situated on the western side of the Tiber River, Trastevere is another of Rome’s trendy neighbourhoods. Home to some wonderful restaurants, bars and boutiques, it’s after dark when this neighbourhood truly bursts to life, offering some of the city’s best nightlife. During the day, Trastevere’s picturesque laneways and public squares act as the perfect backdrop for exploring this part of the city, with sunset onwards welcoming a mix of locals, expats and tourists looking to party the night away. Within walking distance of both the Vatican and Centro Storico, the district is a great option if you’re wanting to celebrate after dark, but should be reconsidered if you happen to be a light sleeper. If you’re set on staying in the neighbourhood but don’t want to deal with noise after nightfall, opt for the district’s east where after dark is generally quieter. What’s in Trastevere? Popular bars, cafes and restaurants, pretty laneways, colourful buildings and plenty of photo opportunities. Stay in Trastevere if… you’re searching for somewhere with plenty to see and do during the day as well as a lively nightlife. Located outside the city centre, Testaccio is a great option if you’re wanting to experience another side of Rome, beyond its tourist hotspots. Found on the outskirts of the city, the district is largely working class and residential, but is also home to one of the city’s main produce markets, a number of authentic trattorias and some nightclubs. Perhaps not as scenic as Trastevere, the district is quieter, filled with character and a good base for exploring more of the city. With fewer tourists staying in the district, not only are accommodation prices cheaper, but there are greater opportunities to simply sit back, relax and soak up the nuances of everyday Roman life. Grab a fresh of coffee, visit a local deli or take a stroll and watch on as the locals go about their day to day routines. What’s in Testaccio? Mattatoio Modern Art Museum, Testaccio Market, Piramide Cestia, and some great restaurants and cafes. Stay in Testaccio if… you’re wanting top notch food, cheaper accommodation and a good starting point for exploring beyond the city centre. 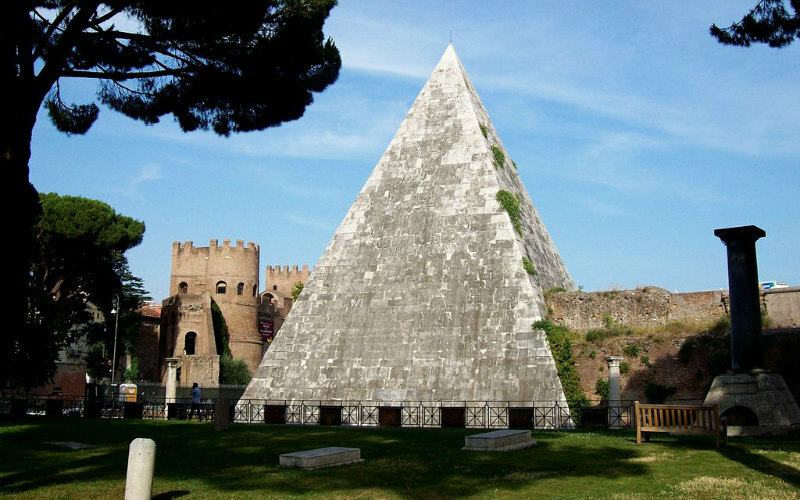 Piramide Cestia, Rome, Italy. Image Credit: Blackcat / CC by SA 3.0. Ready to discover the beauty of Rome? 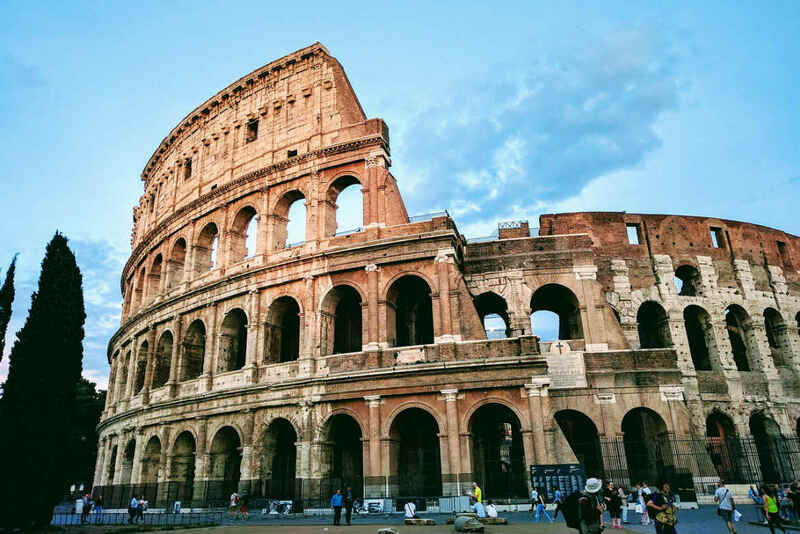 Find cheap flights to Rome, hotels, hire cars and more with Webjet today!